Another Danny Ings goal vs Arsenal has given Southampton a 2-1 lead going into half time in a bizarre game at the St Mary’s so far this afternoon. Ings opened the scoring with a header before Henrikh Mkhitaryan also nodded in an equaliser not long afterwards. 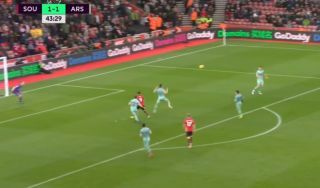 However, Ings has his second headed goal of the game as well now, and Arsenal goalkeeper Bernd Leno seemed to just stand and watch as the strike floated in. While there’s no doubt it’s a decent finish from the former Liverpool man, it does look rather like it all happened in slow motion, with Leno’s lack of reaction a bit worrying! The German joined the Gunners this summer after impressing at former club Bayer Leverkusen, but he needs to do better if he’s going to be number one for a club of this size.